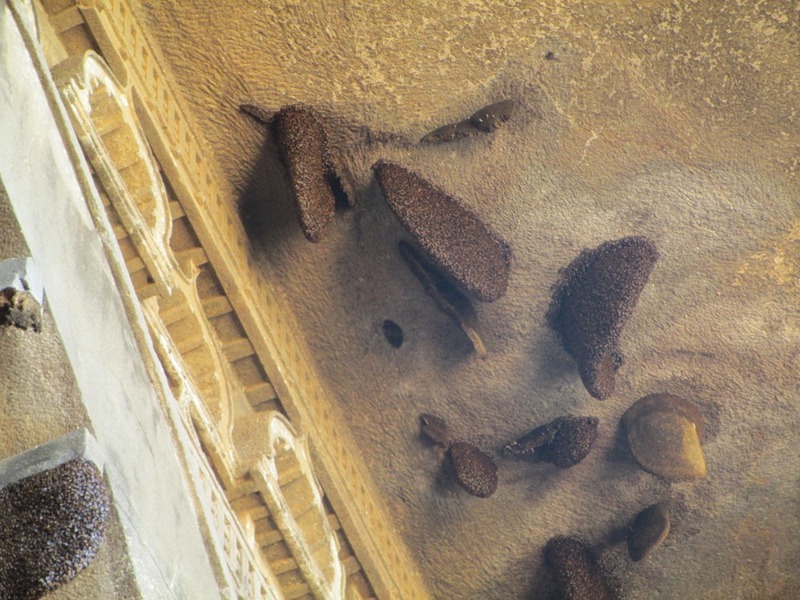 Yesterday we decided to do some sight seeing and the Karla Caves seemed like a good destination. 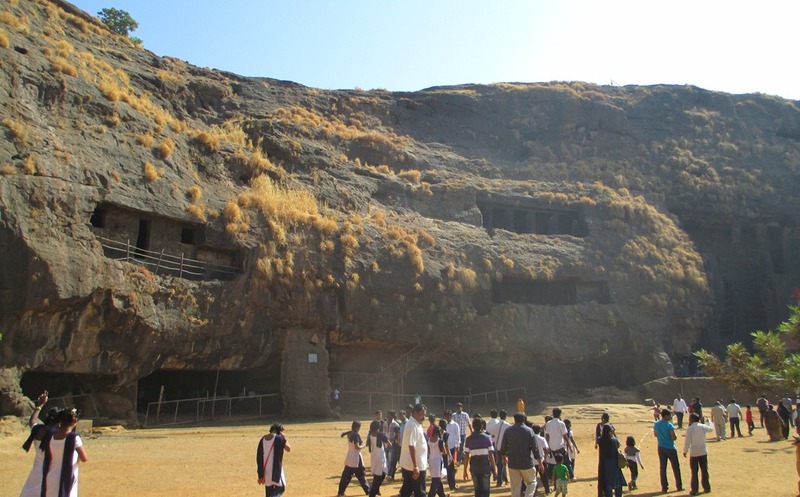 Since reading about the rock-cut architecture of India I have wanted to visit one of these caves. Karla, at 50 kms or so away, is a convenient destination, so we set out early and arrived at 10:30 am or so. And so it goes. The amounts really don’t matter to Westerners. But there are many hard-working Indians who are lucky to make Rs. 500 (or less) in a 12-hour day of actual labor. For that reason I’m loathe to give the same amount to some fast-talker who will spend 30 mins telling me stuff I already know from my wikiPedia reading. Yesterday after a few minutes of haggling I engaged a man for Rs. 200. Ultimately he didn’t have any special insights to impart, but it helped the local economy I suppose. 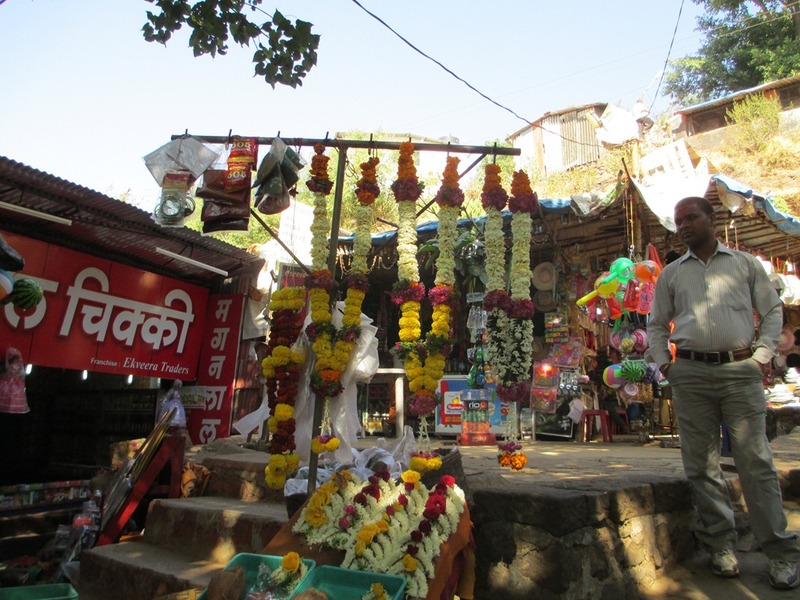 Many of these sell refreshments and souvenirs, but a great many sell marigolds, spices, coconuts – the necessary materials for a puja that Hindus will perform at the temple at the top of the hill. The upper galleries you see are closed off from visitors. 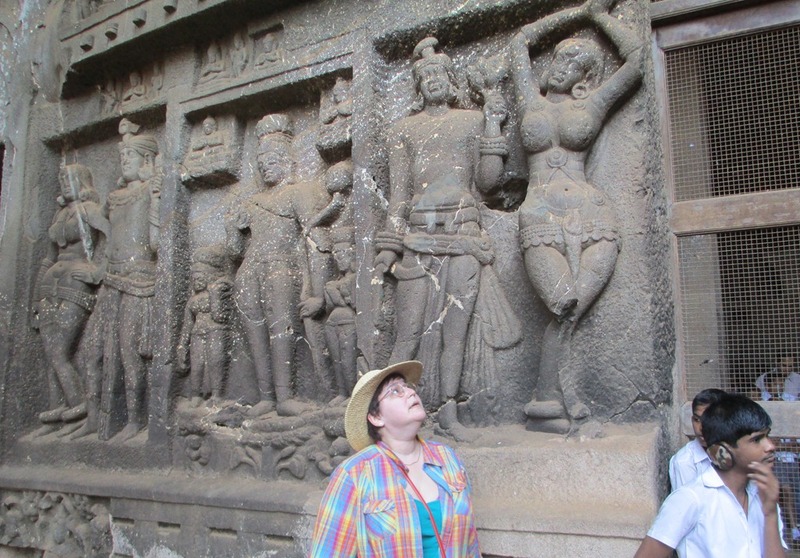 Anyway 2,000 years ago this space in front of the caves was a village-like affair, a stopping point on the Buddhist trade-routes that criss-crossed ancient India. At the far end is the stupa, a dome-like stone housing relics and adorned with inscriptions. This hall magnifies sound; the favorite activity of the many school children visiting was to shout slogans and hear them echo. Again, it was intriguing to imagine 2,000 years ago, the hall full of seated monks and their prayers reverberating. These spaces inside are only a few feet across. Seated in such a place I can see how there would be little distraction – assuming one could get over the distraction of sitting, that is. 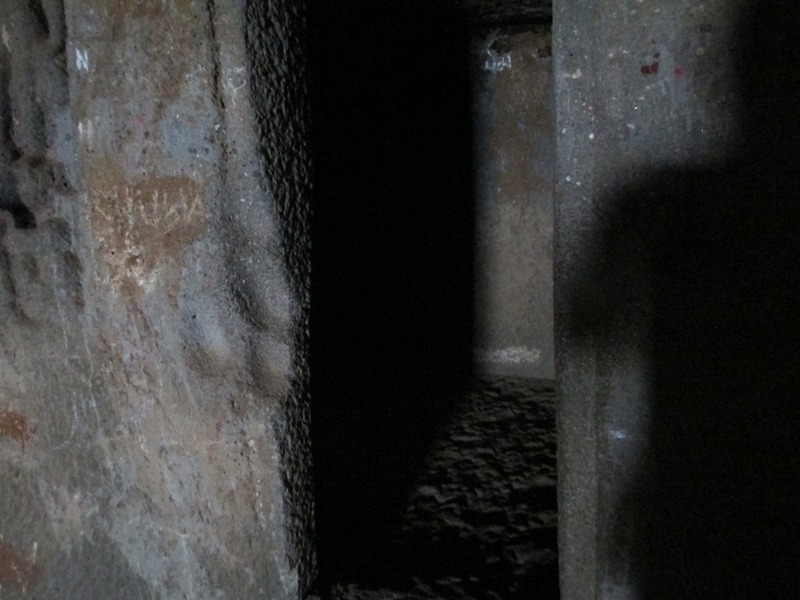 Hearing of these cave-cells I jokingly asked our “guide” if I could see Bodhidharma’s shadow in this place. The guide replied that indeed many Chinese people visited these caves. Sigh. Between the prayer-hall and the meditation cells it’s rather amazing to consider these vast spaces were mainly cut by hand out of solid stone. As I read here, the main technique used was to create small crevices in the stone, push in dry wood, then apply water – the expansion of wet wood fractures the stone. In the centuries since its founding Karla has become more of a Hindu destination than a Buddhist one. 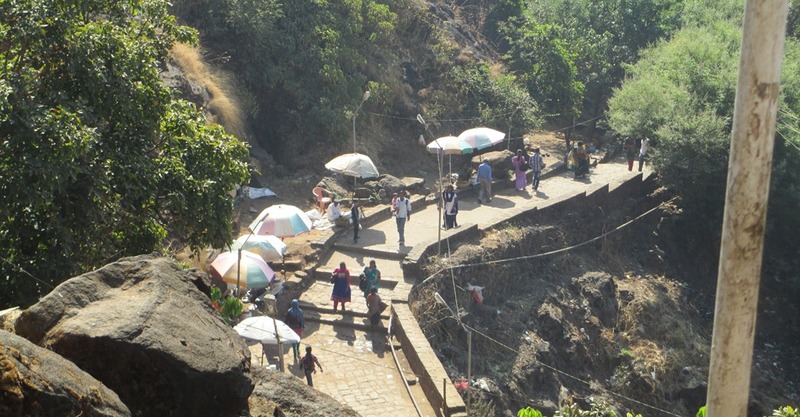 Outside the prayer-hall is a small temple to Ekveera, a goddess revered by Koli people who live mainly in Mumbai. We all went inside and while we could take no photos, for Rs. 40 we all received a ceremonial dab of red dye on our foreheads together with, presumably, the goddess’ blessing. Minerals seem an appropriate keepsake for visiting a cave. The piece on the right is calcite, perhaps two pounds in weight. On the left is what I think is an apophyllite, a common crystal found in Maharashtra. Once again it was time for bargaining. The shopman started at Rs. 2,500 – “These minerals come from this very mountain!” he confidently declared. I was very happy to see his consternation when I suggested 400. I walked away from the booth two times – in one of those cases remarking “I had plenty of rocks back in the US” – only to return to hear more offers. Walking away the 3rd time the shopman came after holding the minerals and we agreed on Rs. 600. As is usual in these cases you have no idea how well you really did – he probably got these pieces for 5 or 10 – but the experience is half the fun. All in all, a very engaging visit. 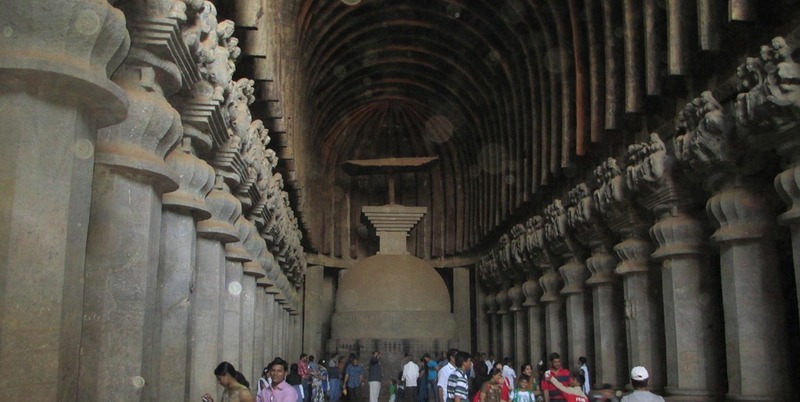 We’d very much like to go on a longer trip to a place like Ajanta Caves, one of the foremost cave temples in India.